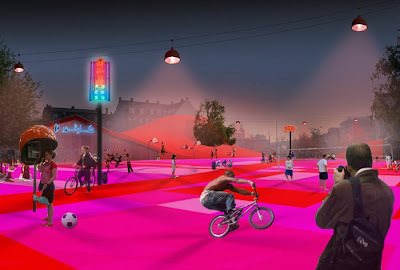 The Superkilen project is part of Partnerskabet (the Partnership), which was formed in 2004 between the municipality of Copenhagen and Realdania. The aim of the project is to make Nørrebro the centre of an innovative urban space of international caliber, which can be an inspiration for other cities and districts. Superkilen is not a complete and finished work of art, but an open art work, which will gain content and take form in a dialogue with the users and citizens of the area. The fundamental basis for the choice of colors for materials and names is that they should be neutral in relation to culture, nationality and language, but over time they can adopt meaning and identity as they are used in urban spaces and populated by city life. The different surfaces and colors of the area are integrated in a way where they together and alone establish a setting for the diverse objects, which are chosen by the citizens. The setting will be characteristic and neutral, significant and discrete – all at the same time. Mission: To create a true alternative scene to the remaining urban space of Copenhagen. Taking our point of departure in Superkilen’s location in the heart of outer Nørrebro, which has a local population from 57 different cultures, we have chosen to focus on those initiatives and activities in the urban spaces that work as promoters for integration across ethnicity, religion, culture and languages. 57 objects from 57 cultures are considered as a mean for integrating Superkilen in the world and the world in Superkilen. The objects are symbols for everyday experiences from 57 different cultures. A foreign everyday practice incorporated outside its normal context. As in Marcel Duchamp’s Objet Trouvé it is ordinary everyday objects, which stand out as work of art when exposed in a new context and on a new background. They make people think about how we organize our daily life and together they make up a global vernacular. 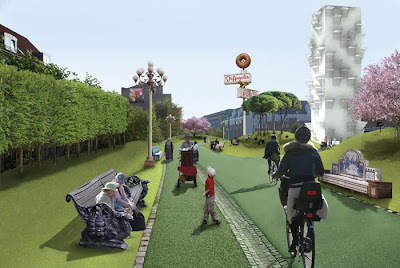 The conceptual point of departure is a division of Superkilen into three zones with three different identity shaping colors: green, black and red. 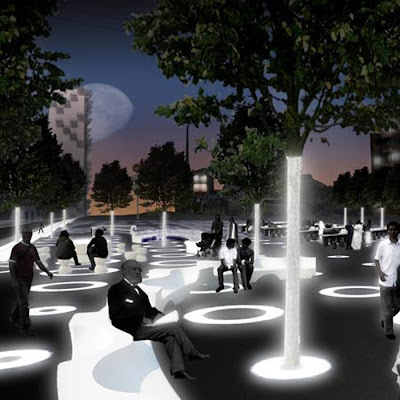 The different surfaces and colors of the area are integrated in a way where they together and alone establish a setting for the diverse objects, which are chosen by the citizens. In spite of the fact that adults and youth from different cultures find the integration process difficult, children can almost always meet and play across linguistic and cultural barriers. The activities at the Green Park – with its soft hills and facing – are focused on children and families with young children. A green landscape and a playground, where families with children can meet for picnics, sunbathing and entertainment in the grass. Already now, it is mostly people from foreign cultures who use the parks along Strandvejen – the Green Park will provide the setting for a similar public life in the heart of Nørrebro. The globalization as such has evolved due to international trade with goods and services. Several of the most successful integration projects in Denmark – especially Bazaar West in Aarhus – are based on markets and trade. A social and economic institution, which is widespread in many parts of the world. But due to supermarkets and discount they have almost disappeared in Denmark. The Black Market provides the setting for an urban market, which can attract visitors from all over Copenhagen and its surroundings in the weekends (ie. the weekend market at Blaak in Rotterdam). An occasion for visitors to come to outer Nørrebro and have a positive experience. During the week, permanent tables and benches will serve as a kind of urban living room for e.g. backgammon-, chess players and others.